A good hike in the hills above Kobe. Take the Hankyu to the Ashigawa station; follow the river on the left side. The road will sort of end but stay left and keep going uphill. This will take you to the “Rock Garden” after you pass a narrow path with stores on each side. Some interesting climbing in the “Rock Garden”. Once you get to the top there are many ways to get back to town. This trip is in the Kyoto area and can take a variety of forms and each one is certainly worth the trip. Take the JR to Kyoto and change for the train going to Kameoka. Trip A – get off at Saga station, take the “Romantic Train”; tickets can be bought next to the station. This open air train will follow the river and lets you off a few JR stops upriver and you can return to Saga by non-romantic train. Trip B – Get off at Kameoka, about three stops past Saga. After leaving the station turn left and after a short walk there are boats that go down the river. 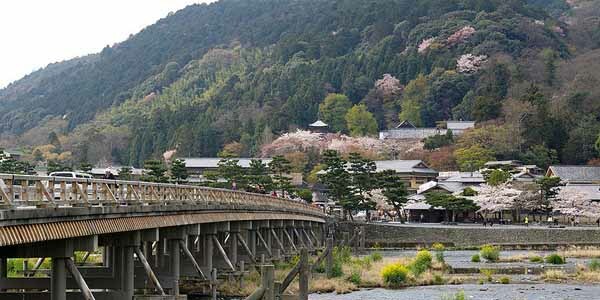 It takes about two hours to get to Arashiyama. Trip C – Get off one stop past Saga (Hozukyo??). This station is on a bridge across the river. After leaving the station follow the river (right, uphill). Stay on this road and after you pass a red bridge there will be a turn off on a trail down to a stream. Take this trail and follow the stream – an interesting walk. After about an hour you come to what looks like a village (hotels). Make a sharp turn uphill on a road and eventually through a tunnel. After the tunnel just keep going down hill and you will reach Arashiyama. There are many ways to go. Try to stay right toward the river. 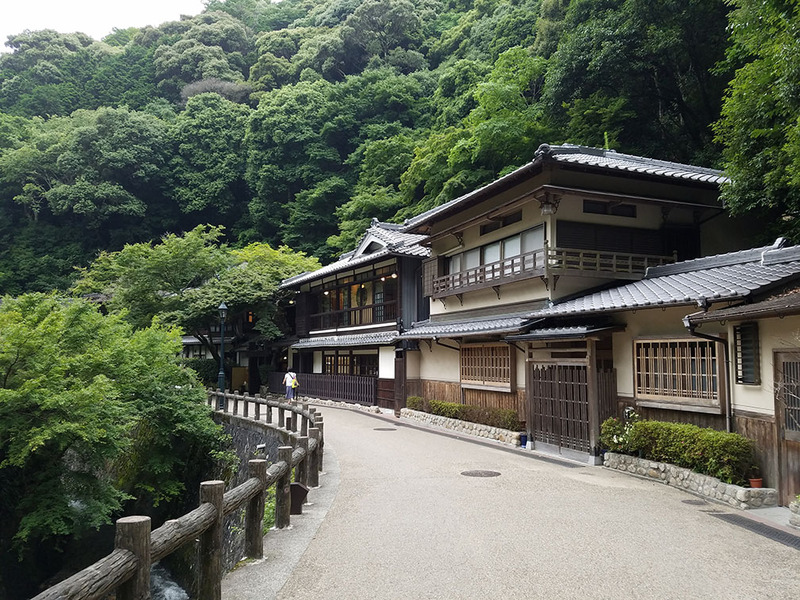 If you end up in Arashiyama, there is much to see and do; monkeys, row boats to rent, people watching, food and nearby temples, bike rentals at the Hankyu station and the Saga JR station. Return trip can be by the JR Saga station or by Hankyu Arashiyama station. The Hankyu station is across the river to the left. Change at Katsura to the Express train going to Umeda (Osaka), change at Juso or Umeda to the Limited Express back to Kobe. Another trip into the hills above Kobe. You can link this up with the trip from Ashigawa. Take the Hankyu and get off at Mikage and walk uphill as far as the road will take you. To the right will be a stream coming from the mountains. Follow that on a road past a crematorium. Shortly after the crematorium there is a trail leading up the mountain. There are many branches but if you continue going uphill you will come to a tea house (food & drink). From the top, if you go right you will meet up with the trail down to Ashiya. If you cross the road and go downhill (the other side of the mountain) you will come to Arima. From there you can take the Kobe Dentetsu Line changing at Shinkaichi for Sannomiya. There are other ways to return from Arima. If you go left you will come to Mt Rokko and the rope way. A good day’s walk whichever way you go. This is a nice short trip just outside Kobe. There is a nice park along a stream and a waterfall. It might get crowded during the autumn and spring when the leaves and flowers are at their best. Take the Hankyu to Juso and change for the Hankyu Takarazuka Line. Get off at Ishibashi and change for the Minoh Line. Get off at the last stop, just about three or four from Ishibashi. From the station walk straight ahead bearing left. There are maps and km markers. Just follow the stream uphill to the falls. You can walk back down on the other side of the river; the trail will take you to the same place at the bottom. There are supposed to be monkeys there but all I saw were droppings.